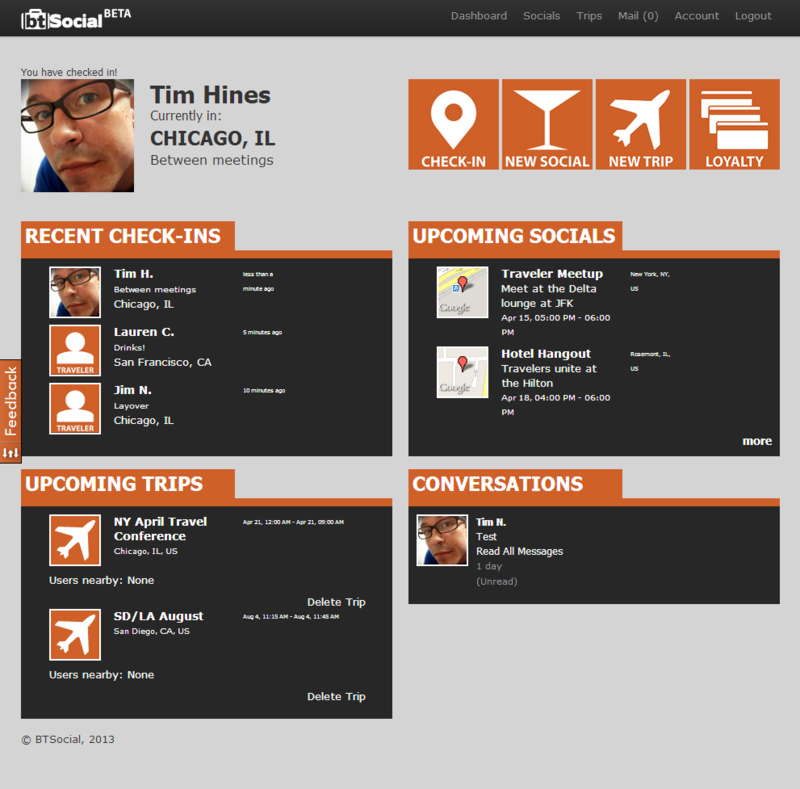 At Chicago Techweek 2012 we met Tim Hines the founder of BT Social. 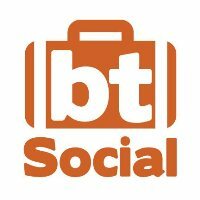 BT Social is “The Business Traveler’s Social Meeting Place”. It’s geared towards business travelers that travel a lot. Whether they travel by plane,train or automobile, as long as they stay in hotels and “travel” this is a place for them. Think about that George Clooney Movie Up In The Air, where Clooney plays the role of a man who travels all over the country firing people. He lives a very disconnected life, he is rarely home and then meets a woman who travels just about as much as him. They spend the night they meet each other comparing loyalty cards and loyalty status for airlines and hotels. Although it’s just a movie there are people out there in the world that travel as much as Clooney does in the movie. Wouldn’t it be great if you could make travel buddies. You could find out if one of your travel buddies is in the hotel lounge that you’re staying at or maybe picking up a bite down the road. You could share travel itineraries with friends a lot and get alerts when you and one of your travel buddies is in the same city/state as you. Well now you can as BTSocial has finally launched to the public. The BTSocial team is solving the traveler’s problem of drinking alone at hotel bars or reading the same tired newspapers during airport layovers. The new app puts the power of networking in the hands of business travelers while on their trips. “Business travelers can now find current friends and colleagues and meet new ones through the app,” said Tim Hines, President. “The app is for business travelers looking to get out of their hotel rooms and create a social experience by meeting other travelers in real life,” he continued. Built for the mobile web, the BTSocial Travel App is accessible on web-enabled phones, tablets and traditional web browsers. “We built a responsive app so that it works on any device business travelers prefer,” said Karl Jackson, CTO. “All of our features, including check-ins, function on any device. Plus users can avoid the clutter of a multitude of apps on their devices,” Karl continued. Users can also use the Trips feature to plan to network during their travel downtime. Unlike other travel apps, it doesn’t ask for your itinerary, but focuses on the gaps of time during trips. When users create a trip, they can enter gaps like layovers or time between meetings to meet other travelers. The Trips feature also allows users to see other travelers that share similar gaps of time to entice meeting up. The most unique feature of the app is Socials, where users can plan their own social events during their trips. Whether hanging out in the hotel bar or airport lounge, users can create a Meetup using the simple feature and invite other travelers. In addition, the events are visible to users that check-in in the vicinity. In addition to the social features, users can also store their loyalty account numbers to avoid carrying those pesky cards. That’s not all, BTSocial even packed in a stats tracker so users can see how active they are on the app. For more information on the BTSocial Travel App and to access it today, visit app.BTSocial.com. Check out this Chicago startup that’s caught first lady Michelle Obama’s eye.